I made this lunch for N and his friend sometime back for after swim. Probably I should call it a snack since they ate another meal shortly after getting in the house. Bear shaped sandwiches with icing eyes. Swiss and cheddar bear shaped cheese with food safe marker accent. 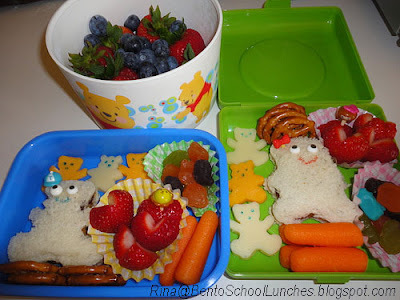 Organic baby carrots, strawberries, fruit snacks and pretzels. Round container of strawberries, blueberries and grapes for me and my friend.